Guide to the Best One Cup Kettle or Hot Water Dispenser. Hi, I'm Sean and I put this site together. I recently moved to a new flat and instead of going for a traditional kettle I decided to investigate one cup options. I really didn't know which to pick so I started doing extensive research - and making copious notes. Soon I realised others could benefit from these too, so I decided to put them online — and this is site is the result. It seems that One Cup Kettles are becoming the latest must have kitchen accessory. They offer the convenience of almost instant boiling water while at the same time saving money on electricity bills. They even help save the planet by not wasting electric heating up too much water. But not every one cup kettle is the same. Some will make you a cup of boiling water, others just very warm water. Some will let you boil several cups at once, others just one. Some get glowing customer reviews, while others leave a lot to be desired. This site is a guide to what's out there currently and aims to help you choose the one cup kettle that's right for you. Some hot water dispensers follow a one size fits all strategy. No matter what the size of the mug you have, they'll dispense the same amount of water. For mugs that are too small this means overspill, for mugs that are too large this mean they're half empty. Still if your favourite mug is the right size this doesn't matter. Variable cup sizes can really help if you've collected lots of different sized cups over the years. Make sure you learn how much each setting dispenses so you always boil the right amount. Remember if you like a bit of milk in your tea, or want to add a bit of cool water to your beverage so you can start drinking right away, you'll want to dispense a bit less than your cups capacity. Hot water dispensers, or as we call them one cup kettles, all have water tanks that are used as reservoirs for the appliance to take the correct amount of cold water from. There are differences between the water tanks on the devices though - and it's especially important to consider the method of filling before picking a device. Some devices have detachable water tanks allowing you to easily fill them up in the sink without unplugging the machine, while others require you to fill them in the device - typically using a jug or cup. Even if the tank is detachable sometimes they are hard to fit under a sink tank, meaning you'll have to use the jug or cup method of filling anyway. We generally prefer the detachable water tanks as not only are they easier to fill, but you'll also be able to clean them more simply. However unlike coffee machine tanks, they aren't dishwasher friendly as the dispenser is attached to the tank. The other thing to look at is the capacity of the water tanks. While filling them isn't too much hassle, a larger water tank is important if you want to save time in a busy environment such as an office or a family home. At first glance speed should be easy to compare, but not every hot water dispenser produces the same amount of water. Variable dispensers take more time to brew larger cups than smaller cups. 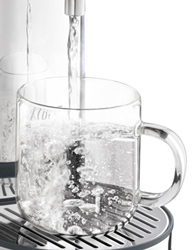 It's not simply about the time spent to brew the water though - it's also how fast it is dispensed into the cup. For tea you're almost certainly going to want a water dispenser that boils the water to 100 degrees Celsius, rather than simply heating it up to a high temperature. However some other drinks such as infusions don't necessarily require boiling water. Most devices reach boiling point, but some also offer variable temperatures in case you want to heat the water little less. If you're just looking to be able to drink your cup a bit earlier you could always put a bit of cold water in the top, but for some drinks exposure to boiling water might damage the taste. If you regularly drink something like certain brands of hot chocolate that shouldn't be boiled go for a one cup kettle that has variable temperatures. Several of the hot water dispensers available have timer options that allow you to set the machine to start brewing for when you wake up. Simply leave a cup with your favourite tea bag or other beverage (although we wouldn't recommend instant coffee as it tastes awful - get a coffee machine instead) on the dispenser, set the timer, and awake to a fresh hot brew. If you've put a cup that's too small for the amount of water that's dispensing then having a stop button can really come in useful. Similarly if you want to leave a little space at the top for milk or cold water, being able to stop the dispenser at the correct point is useful for stopping spills. It's not the end of the world if the machine doesn't have one - you can remove the cup and let it continue dispensing into the drip tray. However this will mean emptying the drip tray more often and is slightly less safe. Some hot water dispensers come with filters, some don't. If you don't mind the current taste of your water then you don't really need a water filter in your hot water dispenser. If you've already got a filter device, you can use this to pour water into your hot water dispenser too. However for those that like their water filtered having a filter built in is a real time saver. Filters also help protect the device from limescale, which may prolong its life although you will need to purchase and fit new filters every so often. Some of the devices with filters have indicators of when they need to be changed. If you forget to put the cup under the dispenser in time, or the cup is too small for the water dispensed then you'll be glad your hot water dispenser has a drip tray. These catch the water allowing you to empty them into the sink later. Most hot water dispensers come with them. Some hot water dispensers will allow you to rotate the device on its base so the dispenser points elsewhere. This can be useful if you've got a really big cup that needs dispensing which won't fit under the drip tray. For our money the Morphy Richards Accents One Cup is the best buy under £50. The price has come down a lot since it was first launched, making it a much better buy than it once was. Water temperature is around 90 degrees when it reaches the cup which is better than many rivals, and dispense time is only 45 seconds. The drip tray makes cleaning easy. Our main complaint is that you can't remove the water tank for refilling. 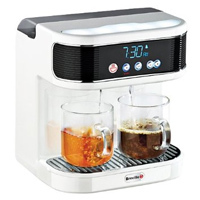 We've selected the Bosch Filtrino II Fast Cup for our best one cup kettle over £50. Unlike the similarly named product for Bosch this has almost universally good reviews. There's several settings for water temperature including boiling. Removable drip tray. Removable water tank. Brita Maxtra water filter. It's a little slower than some other models, but the extra features make the extra few seconds worth it. Copyright © 2015 · One Cup Kettle is a participant in the Amazon EU Associates Programme, an affiliate advertising programme designed to provide a means for sites to earn advertising fees by advertising and linking to Amazon.co.uk.